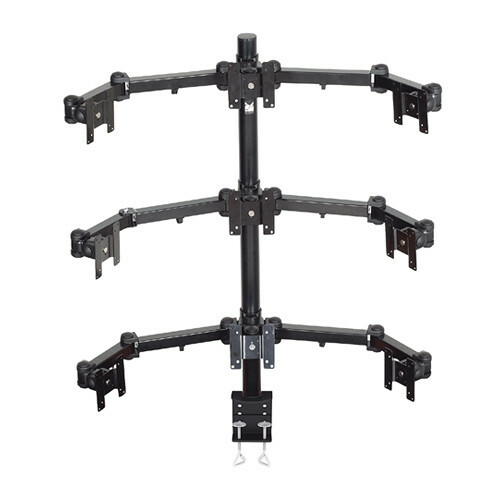 The Premier Mounts MM-AC429 3 Triple Display Arms on 42" Pole (Clamp Base) allows you to mount up to 9 (10 to 22”) monitors on to a single display unit without sacrificing valuable desktop space. The position of each arm can be adjusted along the length of the pole and fixed with the set screws. Each arm has 3 standard VESA (75 x 75 or 100 x 100mm) mounting heads for attaching the monitors. The mounting heads offer 90º omnidirectional movement and 360° rotation, so you can adjust the orientation of the monitors to set the optimum viewing angle. The table clamp base of the 42” (106.68 cm) pole is ideal for applications where a temporary set up is required or for surfaces where it is not possible to use a traditional mount installation. Furthermore, to give a clean finish to the installation, the monitor cables can be routed via the 42” (106.68 cm) pole.